Last month, Film Independent’s Bring the Noise series kicked off with its first-ever event at LACMA’s Bing Theater, giving classic films a fresh and unique twist by screening them with all-new original scores performed live by a rotating group of guest musicians. The January 28 performance commemorated Todd Solondz’s classic 1996 coming-of-age film Welcome to the Dollhouse and featured a surprise appearance by none other than Dawn Wiener herself, aka original Dollhouse star Heather Matarazzo. And to do this black comedy justice, the screening featured original music by Seth Bogart, a professed Dollhouse superfan and frontman of garage-rock outfit Hunx and His Punx. 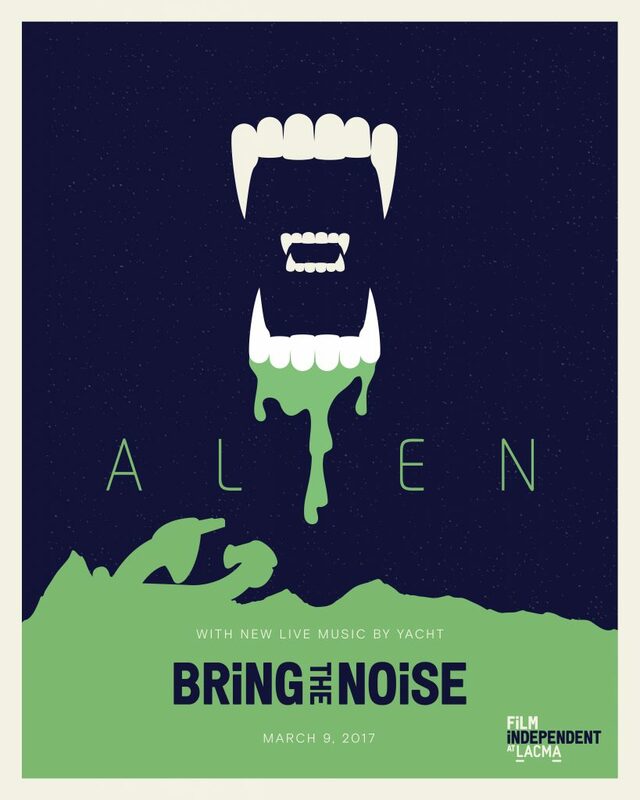 Fast forward to now (or possibly 2122 A.D.) as we proudly announce our next Bring the Noise title, to be screened at LACMA on March 9: Ridley Scott’s iconic 1979 sci-fi/horror classic Alien—set to feature an original score performed live by guest artists YACHT. The film, of course, stars Sigourney Weaver as the iconic Lt. Ripley. After U.S. spacecraft Nostromo is diverted to an empty planet with no trace of humanity, one of the ship’s crew (played by the late John Hurt) becomes infected by a facehugger, who promptly uses his body to incubate a killer xenomorph (don’t worry—it all makes sense once you see it). The crew breaks quarantine to rescue him; the aftermath of this fateful contact forms the thrilling action of the rest of the film. Alien not only won an Academy Award for Best Visual Effects, but the film quickly became a cult classic that continues to receive critical praise as one of Ridley Scott’s best. Alien soon became a franchise with the production of several sequels, prequels and other media revolving around the film’s grim vision of an extraterrestrial haunted house. So if you think aliens and Ridley Scott are as cool as we do, definitely check out Bring the Noise on March 9. Contributing a new and original film score to the screening will be the LA electronic-pop duo YACHT, featuring musicians Jona Bechtolt and Claire L. Evans and Rob Kieswetter. YACHT began as a solo project and became a full-fledged band by 2009, releasing their first full-length album in 2015 called I Thought the Future Would Be Cooler. The group’s punky, upbeat dance music signature is bound to be an alluring accompaniment to the literally out-of-this world horror that Alien so successfully conveys. No need to sign up for a multi-year mission to deep space. All you need to do is buy your ticket for March 9 here. And for more about Bring the Noise, just click here. To find out more information about Film Independent at LACMA events click here. Not a Member of Film Independent yet? Become one today.